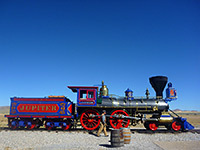 Most visitors to Golden Spike National Historic Site stop only at the park headquarters, next to a half mile section of railroad on which two replica steam trains make regular journeys up and down, to commemorate the ceremony held here on May 10th 1869 marking the completion of the first transcontinental railway; after many years of construction, starting westwards from Omaha and eastwards from Sacramento, the two lines finally met at Promontory Summit in this remote area of northwest Utah, to be joined by a symbolic golden spike (soon removed and placed in the Stanford Museum). There were in fact two sets of lines, very close to each other, built by rival companies (Union Pacific and Central Pacific), and the course of both can still be seen, though the CP tracks are best preserved as this company won the final contract. Other locations in the NHS, all much less popular, include two sections of railroad bed open for driving and a 1.5 mile path (the Big Fill Trail) that visits several embankments and cuttings, but perhaps the greatest appeal of the preserve is the beautiful, desolate surroundings. This part of the state has remained virtually uninhabited and undeveloped, for many miles crossed only by a few unpaved roads, passing unbroken, grassy prairie and scattered mountain ranges, often with the hazy blue expanse of the Great Salt Lake visible to the south. The NHS visitor center opens at 9 am, but all trails and viewpoints are accessible at any time, without payment, and although there is no official campground, quiet and scenic places for free camping can be found along side tracks nearby. The main to approach Golden Spike NHS is from I-15 near Brigham City along Hwy 83, which heads west along the edge of the vast Great Salt Lake basin; the land is flat, salty and marshy to the south, hilly to the north. Apart from the park, the only site receiving much traffic hereabouts is the ATK Aerospace Center (a rocket research facility) - otherwise, development is limited to a few scattered ranches. Twenty miles from I-15, a left turn leads to the NHS (see map), first passing another little-traveled side road to Promontory Point, then climbing a little into a seemingly benign range of low, grassy mountains, yet these were tall enough to provide a significant obstruction to the railway, requiring wide curves and steep grades, approaching the 2% maximum and necessitating use of helper engines, known as hogs, to push the trains uphill. The steep terrain slowed down traffic such that the 140 mile journey between Ogden and the Nevada stateline took 36 hours, hence it soon became clear that a flatter, more direct route was needed, and the line was in operation for only 35 years before being abandoned, replaced by the Lucin Cutoff to the south, a route still used by the present day Southern Pacific railroad. 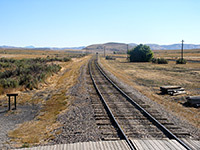 The first point of interest in the National Historic Site is the 1.5 mile (loop) Big Fill Trail, which tours parts of both the competing rail lines, each clearly visible as they cross the road from north to south. 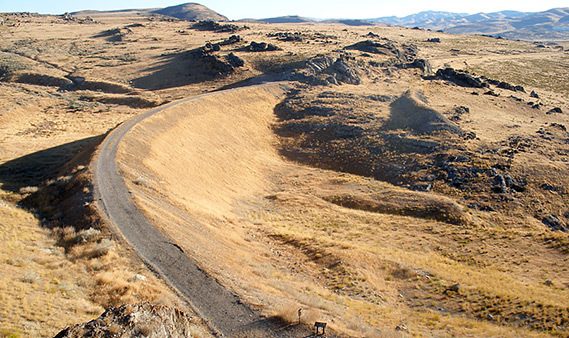 The path follows the upper line (Central Pacific) to the fill - a particularly large embankment over a wide ravine - then returns a short distance to the south along the thinner, more eroded Union Pacific line. Both railroad beds cross the same grassy hillside, past rocky outcrops, through several small cuts and over a few lesser fills. The UP line crossed the ravine via a 400 foot long wooden bridge (the Big Trestle), long since removed, but the abutments at each end can still be seen. On the far side of the highway, the CP line is used by the East Grade Auto Tour, a one-way, 2 mile section open to vehicles (no RVs). After the Big Fill trailhead, the highway climbs a little more up to a wide plateau, becomes quite straight, and heads due west, parallel to the two sets of tracks. The surroundings are grassy, empty though privately owned, used for cattle ranching; a few side tracks branch off including one to remote Locomotive Springs, an important riparian area. 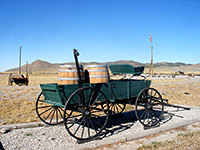 The paved road ends at the Golden Spike visitor center, park headquarters and restored railway, near which are a few old wagons and pieces of machinery, but there isn't much original equipment on view apart from in the museum. The original steam trains that first traveled on the completed line (Central Pacific Jupiter and Union Pacific No. 119) were scrapped in the early 1900s so instead two brightly colored replicas, built in 1979, make the short journey from an engine shed just out of sight behind a nearby hill, to the track beside the center, where they meet at the exact completion spot, accompanied by workers in period costume. A full re-enactment of the original ceremony is held on May 10th each year but locomotives are in operation every day from May to September, and at other times can be viewed in the engine shed. 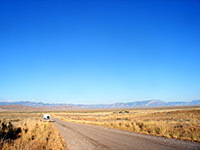 The road, now unpaved but wide and in good condition, continues west over more flat prairie between the low summits of the Promontory Mountains, then starts to descend, as the Great Salt Lake comes into view. The Union Pacific line remains close by, on the north side, and after 7.5 miles the road reaches the start of the West Grade Auto Tour - longer (7 miles) and more evocative than the east tour. Neither see many visitors, however. This point marks the edge of the NHS though the track continues close to the old railway, gradually becoming rougher as the lines veer northwards, crossing salt flats around the edge of the lake. The nearest major towns with hotels close to Golden Spike National Historic Site are Brigham City (26 miles) and Tremonton (22 miles) - follow the links for hotel descriptions and reservations.